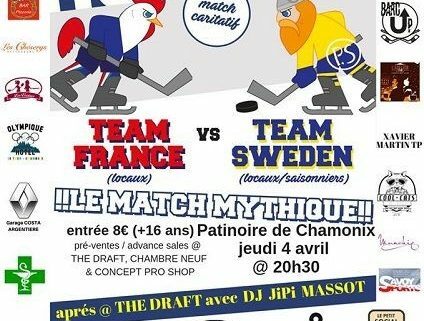 France Vs. Sweden annual ice hockey game for the benefit of the Junior Hockey Club and to support the fight against cancer. Game starts at 8:30 pm, doors open at 8 pm. Places en prévente à Chambre Neuf, The Draft et Concept Pro Shop à Chamonix.